2019 Historic Rally Car Register to celebrate the 60th anniversary of the Mini! The HRCR (Historic Rally Car Register) Open Day returns to the British Motor Museum on 12 January 2019 with the theme being the 60th anniversary of the British Motor Corporation Mini. The winners and their 6 Mini's from the last 10 years of the HRCR Mini Sport Cup will be present to enjoy the traditional rally opening event of the year. As 'the Home of Historic Rallying', the HRCR Open Day is a social gathering where the rally community gathers to meet friends, admire rally cars from the 1950s to the 1980s and talk to organisers of the events that take place in the UK making up the 6 HRCR championships. The HRCR brings together all forms of the sport including historic road and stage rallying, historic endurance rallying, speed events for historic vehicles and scenic tours. Visitors can talk with Championship organisers, register for the championships on the day and join the HRCR. 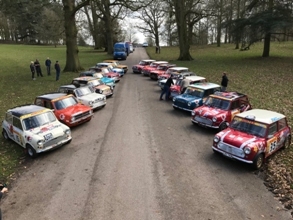 Tom Caren, Show Manager at the British Motor Museum stated "With the 60th anniversary of the iconic British Mini taking place in 2019, its great that the HRCR is using this milestone event as their theme. For those interested in historic rallying the HRCR event is a great social day out and not to be missed plus its a fantastic opportunity to see so many rally cars on display." The HRCR Open Day runs from 9.30am - 4pm and entry is free of charge. Entry to the Museum is extra, there is an advanced discounted rate available online for HRCR members, otherwise normal Museum entry fees apply. The Museum is open from 10am - 5pm. The British Motor Museum will also be celebrating the Mini's 60th anniversary on the 3 & 4 August. On Saturday 3 August there will be a Classic Mini Mosaic World Record Attempt using over 600 classic Mini's (those produced between 1959 and 2000) to spell out 'Mini 60,' whilst on Sunday 4 August there will be a special one day National Metro & Mini Show.